Jigsaws Galore Powerful jigsaw game. Jigsaws included or make your own and email to friends. O in short: Jigsaws Galore is the ultimate jigsaw puzzle game. Play jigsaws included or create your own from your photos. 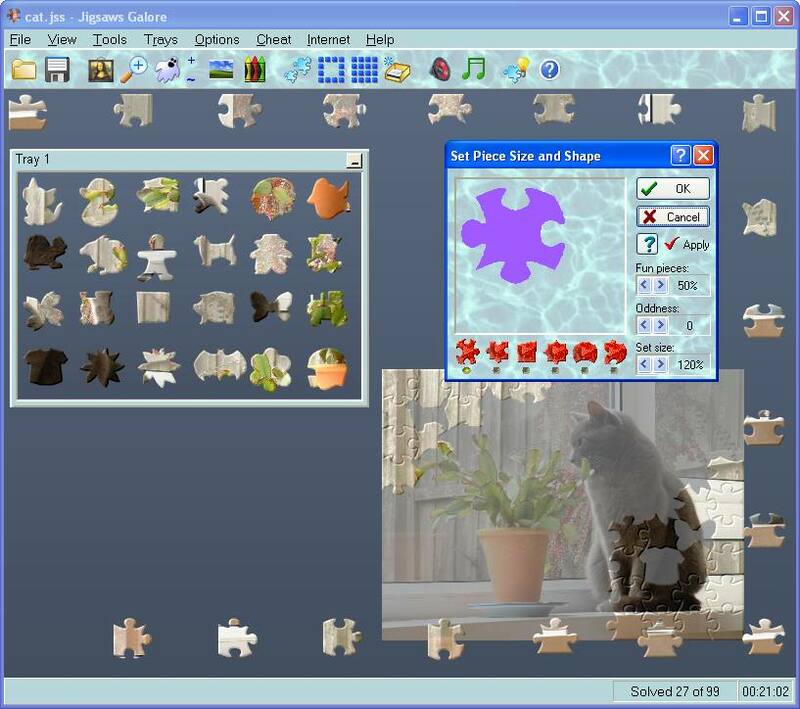 Includes a screensaver which searches for images and plays them as jigsaws capture mode grabs any image on your screen to make a jigsaw. Jigsaws Galore is the ultimate jigsaw puzzle game packed full of features, easy to use and suitable for all ages. Play the jigsaws included or create your own from your photos and e-mail them to your friends and family, a great way to share your photos! Jigsaws Galore plays just like a real jigsaw with traditional, beautifully rendered piece shapes. Puzzles can be customized from 4 to 64,000 pieces to suit the whole family's abilities. An easy to use preview screen displays thumbnails to help you find your favorite jigsaws. Helpful features include the ability to sort and arrange pieces by shape and color automatically, arrange pieces around the edge of the screen or in rows for easy movement into handy trays and an adjustable background ghost picture on which you can solve the puzzle. Extensive cheat modes include highlight next piece, turn all pieces the right way up or simply use Auto-Solve to complete the whole puzzle. Or try to beat the clock with the countdown timer for an extra challenge. Other outstanding features include a screensaver which searches for images and plays them as jigsaws; a capture mode to grab any image on your screen to turn into a jigsaw and a wallpaper feature to turn any jigsaw image into your desktop wallpaper. Customizations include a number of supplied skins or the option to add your own; selectable color schemes of trays and background; programmable sound effects and music play list with support for your own MP3, MIDI and WAV files. You can import various image file formats to create your own jigsaws or grab any displayed image straight off your screen. Great fun while surfing! The demo includes 10 high quality jigsaw pictures and there are free jigsaw sets available after purchase. See above information and user's reviews about Jigsaws Galore Powerful jigsaw game. Jigsaws included or make your own and email to friends.